How do you announce programming for Vegas Uncork’d by Bon Appétit? 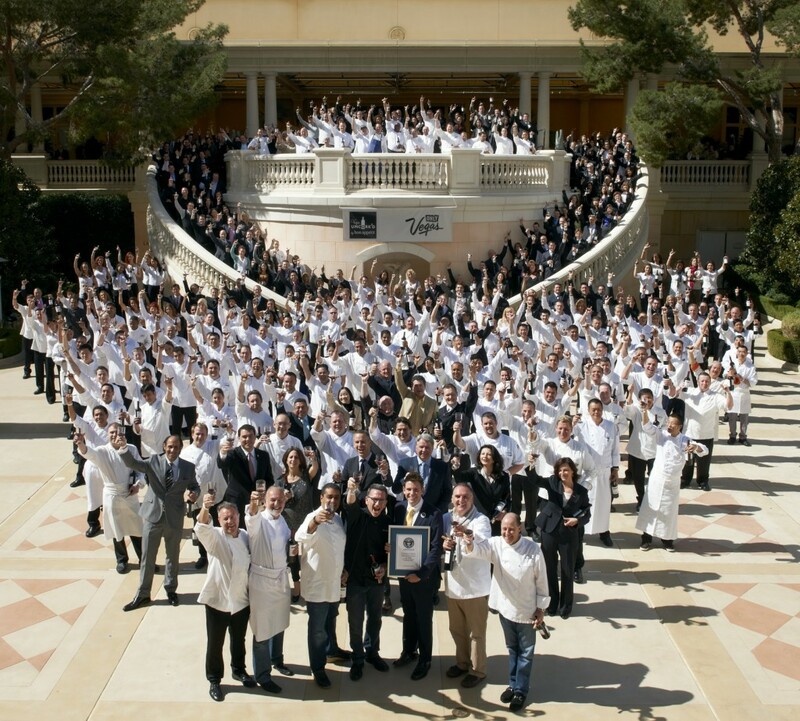 Well, if you’re in Vegas, you gather more than 300 chefs, sommeliers, and hotel staff members from Bellagio, Caesars Palace, The Cosmopolitan of Las Vegas, and Mandalay Bay to break the Guinness World Record for most bottles of wine uncorked simultaneously. The occasion not only announced additional programming for the 6th annual food festival, but also offered the only moment in Hubert Keller’s life when he was nervous to open a bottle of wine. I was also able to catch a rare glimpse of Adam Rapoport’s, Bon Appétit’s Editor in Chief, nervous side when he nearly shattered the record attempt by dropping his bottle moments before the countdown. Fortunately, the wine never met pavement but everyone was obviously doing their best to steady their hands as the air filled with a mix of anticipation and apprehension. Anticipation for the impending record breaking attempt and apprehension because everyone was hoping to avoid becoming part of the small and special group who couldn’t pop their cork in time. To the outsider, the event came off flawlessly with 308 people, perfectly positioned on Bellagio’s Grand Terrace, successfully uncorking a bottle of wine within the 30 second time limit and breaking the previous record of 252. To the PR insider, months of brainstorms, research, preparation, conference calls, meetings, emails and walkthroughs had finally met their culmination in the single moment when the Guinness adjudicator announced the group’s success. From coordinating the live shots in front of The Fountains with Jason Smith, Adam Rapoport, Bradley Ogden, Jose Andres and Rick Moonen, to the distribution of the MNR, this was one event that will go into my PR record book for having the best bouquet (if you’ve never been around to take in the aroma of 308 bottles of freshly opened Cabernet Sauvignon, I highly recommend it).